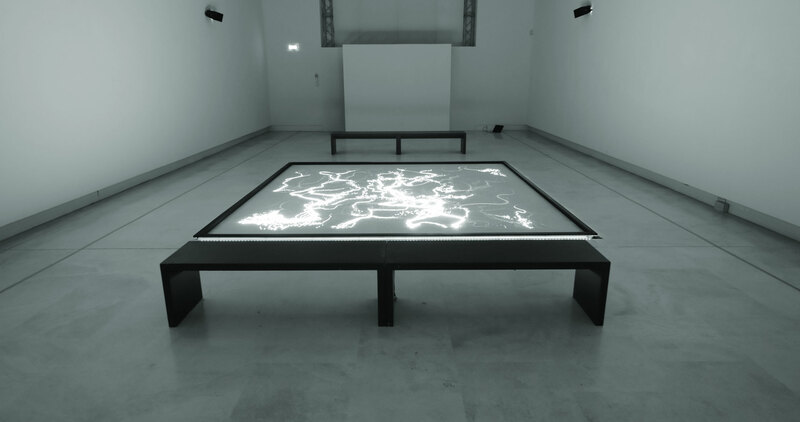 Focused rays of ultraviolet light paint temporary landscapes on a layer of phosphorous dust on the museum floor. Operating on concepts of erosion and mutation, the installation will change its behaviour and visual appearance during the exhibition period. 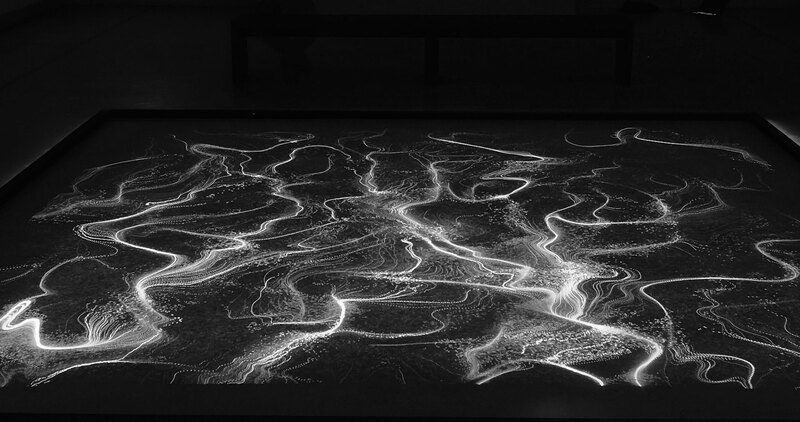 Each trace of light leaves a mark on a virtual mountain range, like water slowly washing out deep canyons. At the hidden digital core of the installation, a piece of code represents that imaginary mountain range. Every beam of light projected onto it behaves like a drop of water, finding its way down to the valley. Whilst doing so, it slightly changes the mountain's shape, carving out deep virtual canyons, resulting in different trajectories throughout the passing of time. Effects of the past influence the future. The evolution during the exhibition period is unpredictable, yet driven by simple universal laws, which once defined, remain untouched. The software code mimics the behaviour of erosion, of gravity and motion. The resulting visual complexity is created by repeated calculations of these basic functions. Phosphor is inspired by Benoît Mandelbrot's fractal geometry, early algorithmic art and contemporary big data models. The software and the mathematical processes have been developed by the artist. Materials used: custom computer software, custom UV laser system, phosphorescent pigments.